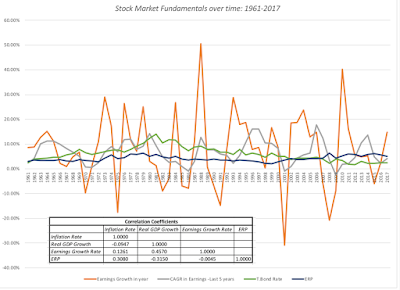 Musings on Markets: Interest Rates and Stock Prices: It's Complicated! Jerome Powell, the new Fed Chair, was on Capitol Hill on February 27, and his testimony was, for the most part, predictable and uncontroversial. He told Congress that he believed that the economy had strengthened over the course of the last year and that the Fed would continue on its path of "raising rates". Analysts have spent the next few days reading the tea leaves of his testimony, to decide whether this would translate into three or four rate hikes and what this would mean for stocks. In fact, the blame for the drop in stocks over the last four trading days has been placed primarily on the Fed bogeyman, with protectionism providing an assist on the last two days. While there may be an element of truth to this, I am skeptical about any Fed-based arguments for market increases and decreases, because I disagree fundamentally with many about how much power central banks have to set interest rates, and how those interest rates affect value. I have repeatedly pushed back against the notion that the Fed or any central bank somehow sets market interest rates, since it really does not have the power to do so. The only rate that the Fed sets directly is the Fed funds rate, and while it is true that the Fed's actions on that rate send signals to markets, those signals are fuzzy and do not always have predictable consequences. In fact, it is worth noting that the Fed has been hiking the Fed Funds rate since December 2016, when Janet Yellen's Fed initiated this process, raising the Fed Funds rate by 0.25%. In the months since, the effects of the Fed Fund rate changes on long term rates is debatable, and while short term rate have gone up, it is not clear whether the Fed Funds rate is driving short term rates or whether market rates are driving the Fed. You have seen me use this graph before, but my point is a simple one. The Fed is less rate-setter, when it comes to market interest rates, than rate-influencer, with the influence depending upon its credibility. While rates were low in the 2009-2017 time period, and the Fed did play a role (the Fed effect lowered rates by 0.77%), the primary reasons for low rates were fundamental. It is for that reason that I described the Fed Chair as the Wizard of Oz, drawing his or her power from the perception that he or she has power, rather than actual power. That said, the Fed effect at the start of 2018, as I noted in a post at the beginning of the year, is larger than it has been at any time in the last decade, perhaps setting the stage for the tumult in stock and bond markets in the last few weeks. Short term T.Bill rates and the Fed Funds rate move together strongly: The result backs up the intuition that the Fed Funds rate and the short term treasury rate are connected strongly, with an R-squared of 56.5%; a 1% increase in the Fed Funds rate is accompanied by a 0.62% increase in the T.Bill rate, in the same month. 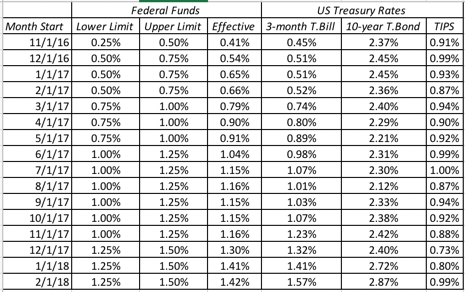 Note, though, that this regression, by itself, tells you nothing about the direction of the effect, i.e., whether higher Fed funds rates lead to higher short term treasury rates or whether higher rates in the short term treasury bill market lead the Fed to push up the Fed Funds rate. 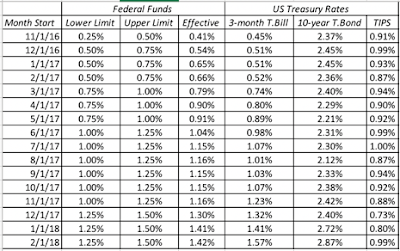 T.Bond rates move with the Fed Funds rate, but more weakly: The link between the Fed Funds rate and the 10-year treasury bond rate is mush weaker, with an R-squared of 6.7%; a 1% increase in the Fed Funds rate is accompanied by a 0.19% increase in the 10-year treasury bond rate. 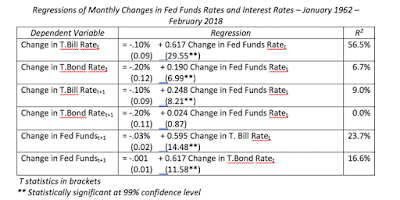 T. Bill rates lead, Fed Funds rates lag: Regressing changes in Fed funds rates against changes in T.Bill rates in the following period, and then reversing direction and regressing changes in T.Bill rates against changes in the Fed Funds rate in the following period, provide clues to the direction of the relationship. 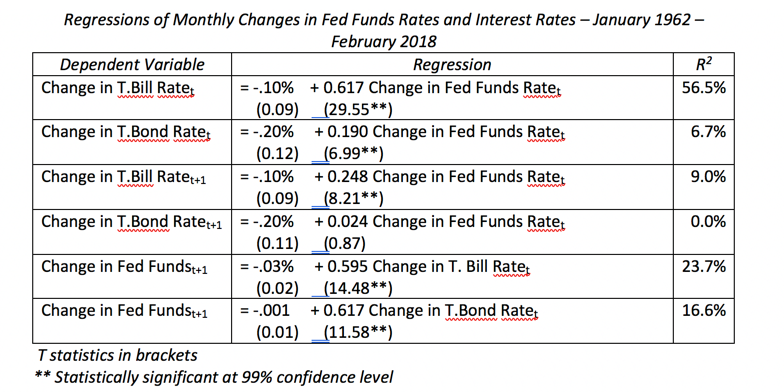 At least over this time period, and using monthly changes, it is changes in T.Bill rates that lead changes in Fed Funds rates more strongly, with an R squared of 23.7%, as opposed to an R-squared of 9% for the alternate hypothesis. 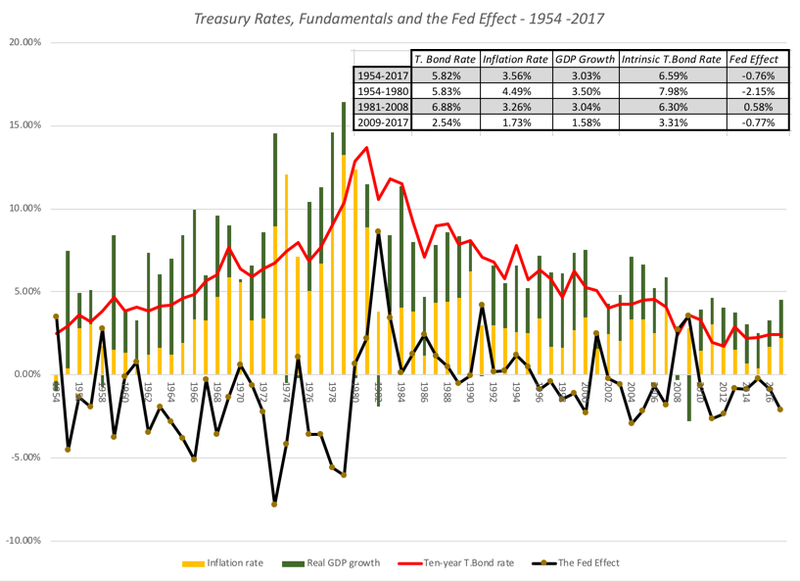 With treasury bond rates, there is no lagged effect of Fed funds rate changes (R squared of zero), while changes in T.Bond rates do predict changes in the Fed Funds rate in the subsequent period. The Fed is more a follower of markets, than a leader. The bottom line is that if you are trying to get a measure of how much treasury bond rates will change over the next year or two, you will be better served focusing more on changes in economic fundamentals and less on Jerome Powell and the Fed. As you can see in this picture, holding all else constant, and raising long term interest rates, will increase the discount rate (cost of equity and capital), and reduce value. 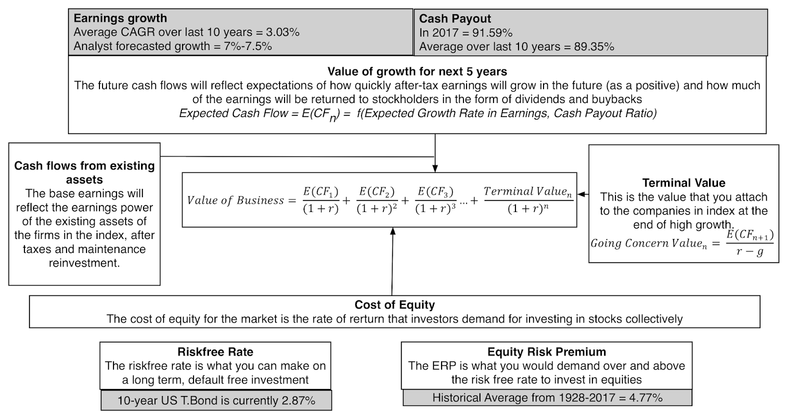 That assessment, though, is built on the presumption that the forces that push up interest rates have no effect on the other inputs into value - the equity risk premium, earnings growth and cash flows, a dangerous delusion, since these variables are all connected together to a macro economy. The co-movement in the variables and their sensitivity to macro economic fundamentals is captured in the correlation table. Higher inflation, over this period, is accompanied by higher earnings growth but also increases equity risk premiums and suppresses real growth, making its net effect often more negative than positive. 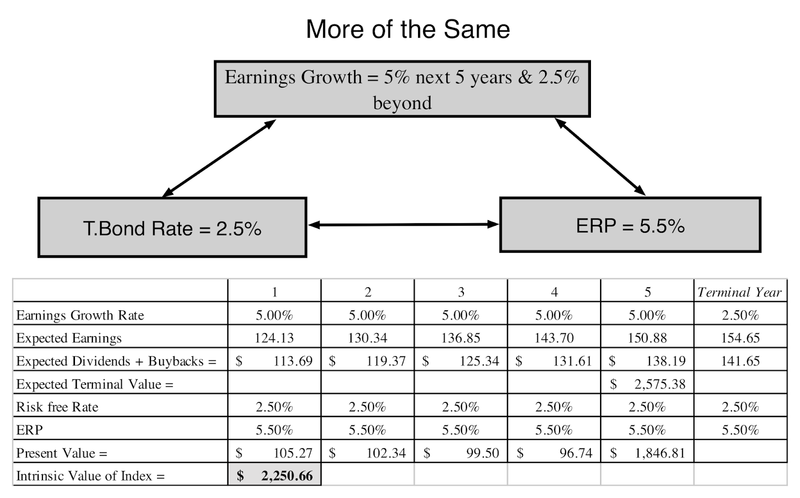 Higher real economic growth, on the other hand, by pushing up earnings growth rate and lowering equity risk premiums, has a much more positive effect on value. 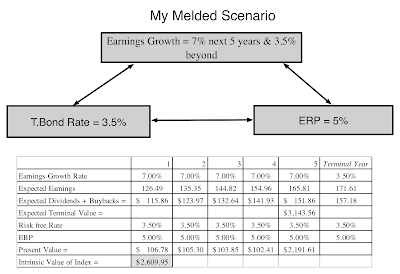 In my post from February 10, right after the last market meltdown, I offered an intrinsic valuation model for the S&P 500, with a suggestion that you fill in your inputs and come up with your own estimate of value. Some of you did take me up on my offer, came up with inputs, and entered them into a shared Google spreadsheet and, in your collective wisdom, the market was overvalued by about 3.34% in mid-February. While making assumptions about risk premiums, earnings growth and the treasury bond rate, I should have emphasized the importance of narrative, i.e., the macro and market story that lay behind your numbers, since without it, you can make assumptions that are internally inconsistent. To illustrate, here are two inconsistent story lines that I have seen in the last few weeks, from opposite sides of the spectrum (bearish and bullish). 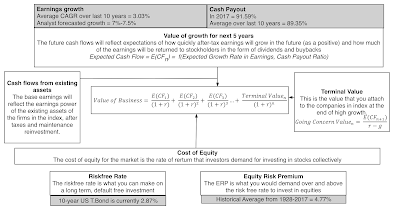 In the bearish version, which I call the Interest Rate Apocalypse, all of the inputs (earnings growth for the next five years and beyond, equity risk premiums) into value are held constant, while raising the treasury bond rate to 4% or 4.5%. Not surprisingly, the effect on value is calamitous, with the value dropping about 20%. 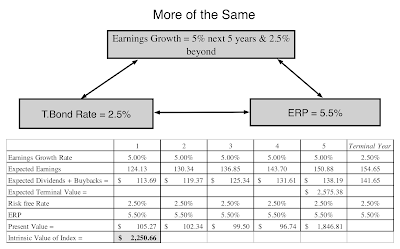 While that may alarm you, it is unclear how the analysts who tell this story explain why the forces that push interest rates upwards have no effect on earnings growth, in the next 5 years or beyond, oron equity risk premiums. 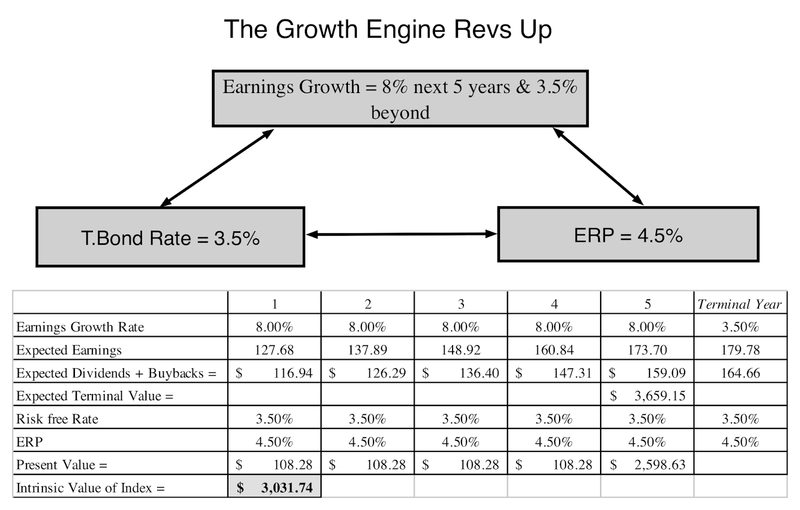 In the bullish version, which I will term the Real Growth Fantasy, all of the inputs into value are left untouched, while higher growth in the US economy causes earnings growth rates to pop up. The effect again is unsurprising, with value increasing proportionately. While neither of these narratives is fully worked through, there are three separate narratives about the market that are all internally consistent, that can lead to very different judgments on value. More of the same: In this narrative, you can argue that, as has been so often the case in the last decade, the breakout in the US economy will be short lived and that we will revert back the low growth, low inflation environment that developed economies have been mired in since 2008. In this story, the treasury bond rate will stay low (2.5%), earnings growth will revert back to the low levels of the last decade (3.03%) after the one-time boost from lower taxes fades, and equity risk premiums will stay at post-2008 levels (5.5%). The index value that you obtain is about 2250, about 16.4% below March 2nd levels. 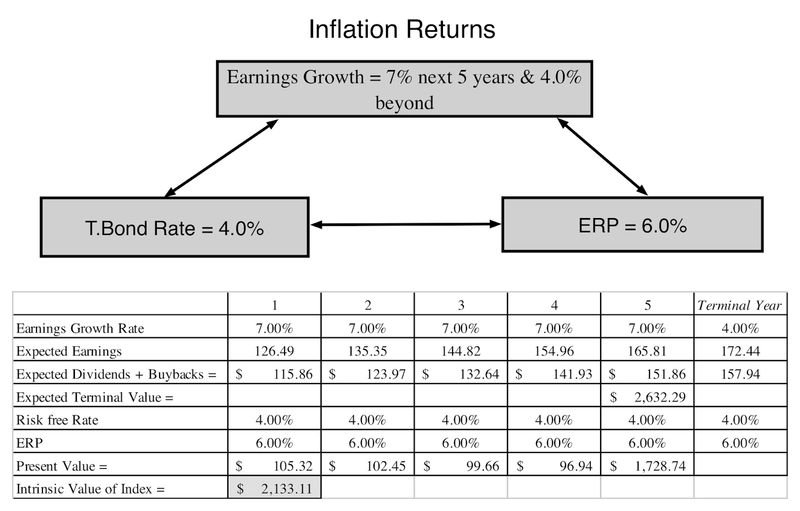 The Return of Inflation: In this story line, inflation returns, though how the story plays out will depend upon how much inflation you foresee. 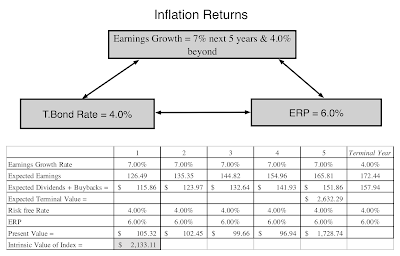 That higher inflation rate will translate into higher earnings growth, though the effect will vary across companies, depending upon their pricing power, but it will also cause T. Bond rates to rise. If the inflation rate in the story is a high one (3% or higher), the equity risk premium may also rise, if history is any guide. With an inflation rate of 3% and an equity risk premium of 6%, the index value that you obtain is about 2133, about 20.7% below March 2nd levels. The Growth Engine Revs Up: In this telling, it is real growth in the US economy that surges, creating tailwinds for growth in the rest of the world. 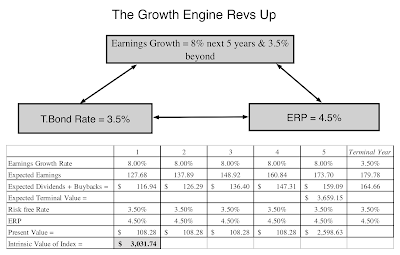 That higher real growth rate, while pushing up earnings growth for US companies (to 8% for the near term), will also increase treasury bond rates (to 3.5%), as in the inflation story, but unlike it, equity risk premiums will drift back to pre-2008 levels (closer to 4.5%). The index value that you obtain is about 3031, about 12.7% above March 2nd levels. 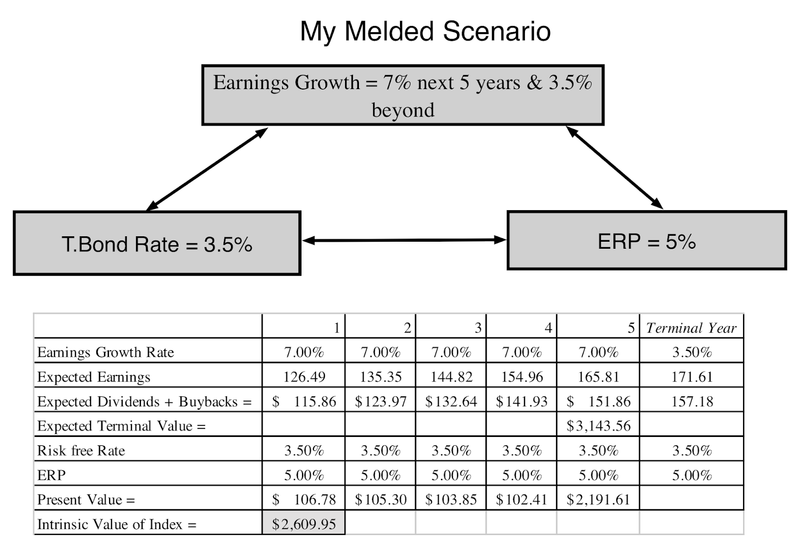 A Melded Version: I believe in a melded version of these stories, where inflation returns (but stays around 2%) and real growth in the economy increases, but only moderately. That will translate into higher treasury bond rates (my guess would be 3.5%), with a proportionate increase in earnings growth (at least in steady state) and an equity risk premium of 5%, splitting the difference between pre-crisis and post-crisis periods. The index value that I obtain, with these assumptions, is about 2610, about 3.1% below March 2nd levels. You can see, even from this limited list of scenarios, that to assess how stock prices will move, as interest rates change, you have to also make a judgment on why interest rates are moving. An inflation-driven increase in interest rates is net negative for stocks, but a real-growth driven increase in interest rates is a net positive. In fact, the scenario where interest rates go down sees a much bigger drop in value than two of three scenarios, where interest rates rise. When macro economic fundamentals change, markets take time to adjust, translating into market volatility. During these adjustment periods, you will hear a great deal of market punditry and much of it will be half baked, with the advisor or analyst focusing on one piece of the valuation puzzle and holding all else constant. Thus, you will read predictions about how much the market will drop if treasury bond rates rise to 4.5% or how much it will rise if earnings growth is 10%. 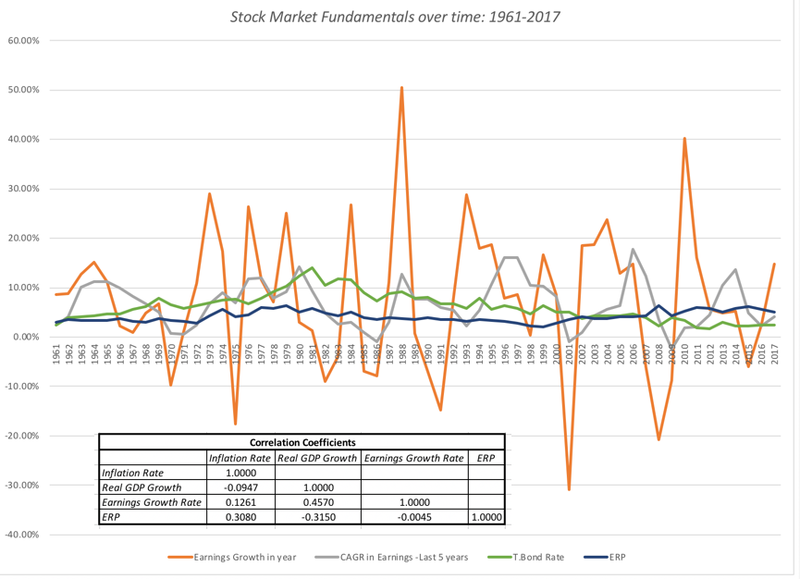 I hope that this post has given you tools that you can use to fill in the rest of the story, since it is possible that stocks could actually go up, even if rates go up to 4.5%, if that rate rise is precipitated by a strong economy, and that stocks could be hurt with 10% earnings growth, if that growth comes mostly from high inflation. I also hope that, after you have listened to the narratives offered by others, for what markets will or will not do, that you start developing your own narrative for the market, as the basis for your investment decisions. You've seen my narrative, but I will leave the feedback loop open, as fresh data on inflation and growth comes in, and I plan to revisit my narrative, tweaking, adjusting or even abandoning it, if the data leads me to. Awesome post professor!! I just have one question with regards to the input (EPS to be exact) that you use in your model.